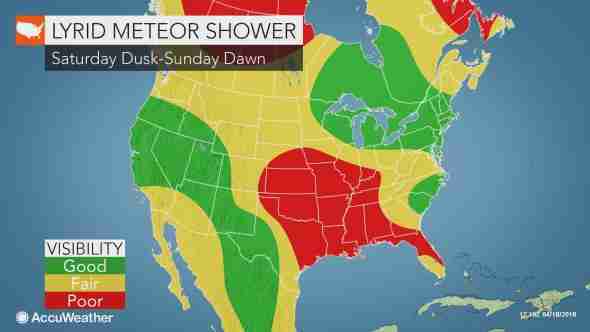 It's been months since a meteor shower last graced the skies over the United States. Fortunately, it's getting warmer, and the prospect of sitting outside to spot streaks of light across the night sky is a little more appealing. The Lyrid Meteor Shower will arrive the night of April 21 into the morning of April 22. The Lyrids come from the Comet Thatcher, which only makes a trip around the sun every 415 years. Bill Cooke, who leads NASA's Meteoroid Environment Office, tells Thrillist you should only expect between 10 and 15 meteors per hour this year. NASA's Jet Propulsion Laboratory and the Space Science Telescope Institute suggest we may even get as many as 20 per hour on the night of the peak. The celestial show produced by the Lyrids tends to lack persistent trains (the tail of the meteor). However, it is capable of occasionally producing fireballs, which are essentially just extremely bright meteors. The shower produces a relatively low rate of meteors compared to some of the year's best showers. Additionally, the moon is at first-quarter phase, which is relatively bright. However, when the moon sets just after midnight, you should have great conditions for meteor watching. You'll want to head outside around midnight local time. The actual peak of the shower should come just after midnight, but you want to give your eyes time to adjust to the darkness before the peak arrives. To have the best experience, you need to have a little patience. Get out of town. Head somewhere with dark skies, free from the light pollution of the city. And, as mentioned above, arrive a little early. You want to pick a place with clear sightlines of the sky. It's also worth checking the weather to make sure you have clear skies before you spend a bunch of time hunting for the right spot to watch meteors. The Accuweather visibility map above is a good place to start. The meteors will appear to emanate from the constellation Lyra (the Harp), but that doesn't mean you should stare straight at the constellation. The meteors will be moving away from it. Knowing where the constellation is can help, but you're also fine just looking up. If you're in a part of the country still battling the snow, you can always find a live stream and enjoy from the comfort of your couch. 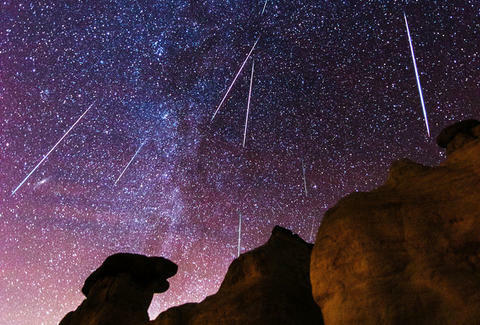 Sites like Slooh often have a hosted stream of events like the Lyrid Meteor Shower. Though, that's a sorry replacement for actually being out under the sky on a clear night.